On July 3, 9 students of Beppu University (Graduate School of Literature) majoring in Cultural Properties Studies visited the Institute, led by two professors, to observe the state-of-the-art research on the science of cultural properties and restoration. Specifically, they visited the X-ray Room on the basement, the Restoration Materials Science and Analytical Science Sections as well as the Restoration Studio of the Center for Conservation Science and Restoration Techniques, and the Special Exhibition on the 1st floor. Representatives of these sections explained their activities and answered questions from the students. 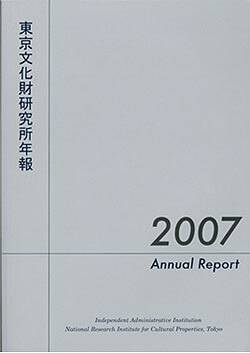 The Annual Report (2007) and the Profile (2008) of the National Research Institute for Cultural Properties, Tokyo have been published. The Annual Report comprehensively describes what the Institute has achieved in its activities last year. In the wake of the unification of institutes within the National Institutes for Cultural Heritage, the annual plan, the project report and materials related to the Institute have been revised for the 2007 report.The Profile presents the research organization of the Institute as well as its various activities scheduled for the current year in two languages (Japanese and English) and in a visual form for easy understanding. A copy each of the Annual Report and the Profile are distributed to national and prefectural museums and to libraries of universities with divisions on cultural properties study.Copies of the Profile as well as those of the TOBUNKEN News are distributed to the general public at the Institute and Kuroda Memorial Hall. The Annual Report and the Profile are available as PDF files for perusal on our website. What is the National Research Institute for Cultural Properties, Tokyo? This fiscal year, the National Research Institute for Cultural Properties, Tokyo published a brochure for children entitled What’s the National Research Institute for Cultural Properties, Tokyo? The aim of this brochure is to introduce the Institute to elementary school children and junior high school students. A cartoon character named “Tobunken no Empitsukun” introduces cultural properties and the activities of each of the Institute’s departments and centers in an easy to understand way. 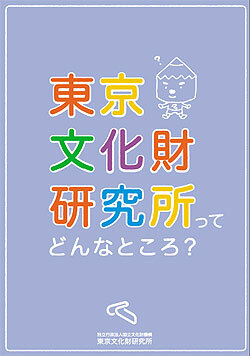 This brochure is scheduled to be distributed to the children of public elementary and junior high schools in Taito-ku. Of course, they are also available at the Institute and at Kuroda Memorial Hall for visitors. kids/2008.pdf The website for children will continue to be developed further. A monthly workshop of the Department of Research Programming was held on July 23. Mr. Takahashi Hideharu (Chief of the Art Section, Aichi Prefectural Museum of Art) was invited to present a lecture on “Torn Trousers,” a work by Fuji Gazo (1853-1916) who played an important role in encouraging Kuroda Seiki to become a painter. The work was accepted by Le Salon during Fuji’s study in France, but little was known about its later history except that it had been bought by an American. Thus, for many years no researcher encountered the actual work. Therefore, the presentation by Mr. Takahashi is about one of the most significant discoveries in recent years not only for researchers of Kuroda Seiki but for those of Japanese modern art in general. The presentation included a detailed report about the American collector who bought the work, historical facts about the discovery, and the present state of the work. The work is scheduled to appear, in a color print, on the 358th issue of The Bijutsu Kenkyu (The Journal of Art Studies) which is scheduled to be published in early November), together with an expository article by Mr. Takahashi. The Institute is currently engaged in the work of tracing the history of the Institute since the founding of its predecessor, The Institute of Art Research, in 1930, with the publication of “75 Years of the National Research Institute for Cultural Properties, Tokyo” in fiscal year 2009 in view. In July, investigations were held at the homes of the families of the late Umezu Jiro (1906-1988), a former member of the Institute who specialized in the research of picture scrolls in Japan, and of the late Ogyu Chikaharu (1884-1944), another former member who was in charge of the management of Kuroda Memorial Hall. Although some materials on Umezu have already been donated to the Institute and made available to the public, new materials were found during this investigation to supplement them. Previously, the Institute had had only limited information about Ogyu, including the facts that his wife Sumi was the sister of Kuroda Seiki, the Western-style painter who willed that the establishment of the Institute and that he studied Western-style painting at The Tokyo Art School. 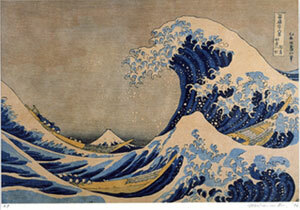 However, during this investigation several dozens of his Western-style paintings (though small in format), some photographs (including one of a portrait of Kuroda’s sister) and other valuable materials that reveal the artistic style of Ogyu, who studied the plein-arist style of paintings of Kuroda and other artists, and his acquaintances were found. Since Ogyu’s family was related to the Sakai family (lord of the feudal Tsuruoka clan), he painted a portrait of Sakai Tadaatsu (15th lord of the clan) and his wife in the Meiji period. It was found that this portrait is now in the collection of the Sakai family. These findings will be incorporated into the profiles of former members of the Institute to be included in “75 Years of the National Research Institute for Cultural Properties, Tokyo.” Investigations like these are expected to serve as basic materials for the history of the achievements of researchers of cultural properties, about which not much has been investigated until now. The Tokugawa Art Museum possesses many instruments used in gagaku and nohgaku. We investigated nohkan, ryuteki and hitoyogiri flutes in the Museum’s collection. Of the two nohkan in the collection, one named “Semiore” with a certificate of authenticity by the master Seibei VII of Fujita School of Noh is said to have been made by Shishida. Radiographs of this nohkan taken with the cooperation of researchers Otsuka and Matsushima at the Center for Conservation Science and Restoration Techniques revealed that it was made not by using the conventional method but by using a single thick bamboo material. The small inner diameter of the nohkan between the hole for the mouth and first finger hole contributes to unique, sharp sound of the nohkan. While the conventional method involves inserting a separate piece called nodo (throat) into this portion, no sign of such a piece having been fitted was discovered. This points to the existence of a different method for making nohkan. According to some researchers, nohkan with a small inner diameter is a result of some incident in repairing a broken ryuteki. Our finding suggests that this theory needs to be corrected. 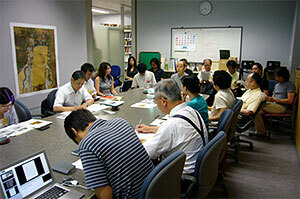 For two weeks from July 14 to 25, 2008, a training course was held with the attendance of 29 members in charge of conservation at museums in Japan. The aim of the course was to help these members acquire basic knowledge and techniques necessary for their work. 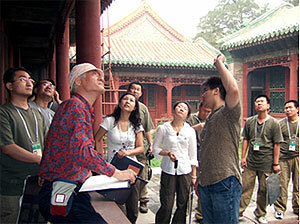 The curriculum of the course included management of indoor environment such as temperature, humidity and air pollution as well as prevention of damage to cultural properties by insects and molds and treatment measures and matters related to the deterioration and restoration of cultural properties such as Japanese-style paintings and urushi objects. Furthermore, an on-site practice on environmental assessment was conducted at the Saitama Prefectural Museum of History and Folklore. Though it is difficult to study subjects of such a variety in a nine-day course, the paring ticipants were very eager to learn. We hope that after the course they will return to their respective institutions and work for the management and improvement of museum environment by improving the quality of their work based on what they have learned in the course. The Training Course for Museum Curators is held in July every year, and information sheets for applicants are distributed from January to February. We look forward to having many people participates in the coming course. 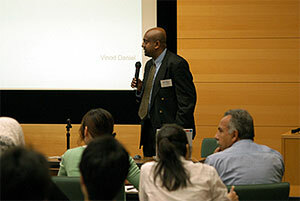 The Center for Conservation Science and Restoration Techniques is engaged in a project entitled “Analysis of the Environmental Condition Surrounding Cultural Properties.” On July 10, 2008, Mr. Vinod Daniel of the Australian Museum, who was visiting Japan, spoke at a seminar held in the conference room of the Institute on the topic of international trends in museums with regard to collections and collections care. In his lecture, Mr. Daniel introduced case studies on the conservation and utilization of folk cultural properties in the Pacific, subjects about which the Australian Museum is engaged in. The influence of global warming and the issue of energy consumption at museums were also discussed among the participants. Prediction of damages to cultural properties based on the Disaster Prevention System for Cultural Properties. Areas framed in light blue experienced strong tremor (JMA seismic intensity 5 lower or more); light blue circles indicate cultural properties (buildings) located in these areas; blue squares indicate actually damaged cultural properties. Since 2003, the National Research Institute for Cultural Properties, Tokyo has been engaged in a 5-year plan entitled “Disaster Prevention for Cultural Properties”. Included in the plan is the development of Disaster Prevention System for Cultural Properties (nationally designated cultural properties) based on a geographical information system (GIS). Several earthquakes have occurred in Japan since 2003 causing extensive damages. In 2008, also, an earthquake of magnitude 7.2 occurred around 8:43 a.m. on June 14, with its epicenter in southern Iwate prefecture (the Iwate – Miyagi Nairiku Earthquake in 2008). Many people fell victim to this earthquake, mainly due to landslides in mountainous areas. It also caused extensive damages to buildings and infrastructure. Damages induced by the earthquake to cultural properties designated by the national government have been reported at 30 locations in Iwate, Miyagi and Akita prefectures (according to investigation by the Agency for Cultural Affairs on August 20, 2008). 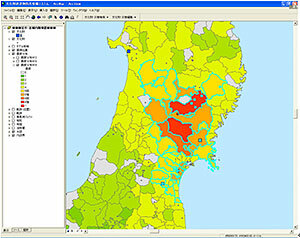 Immediately after the earthquake, the Institute used its Disaster Prevention System for Cultural Properties in order to identify areas strong motion areas by the earthquake and cultural properties designated by the national government (buildings) located in these areas (in the figure, areas framed in light blue experienced JMA seismic intensity of 5 lower or more, and light blue circles indicate cultural properties in these areas). It was later found that a relatively small number of buildings (9 out of 30) had suffered damages, mostly minor ones. However, since some damages were discovered in areas remote from those where possible damages had been predicted, it is believed that improvements should be made to the system, including those related to methods for prediction. On July 31 and August 1, more than one month after the earthquake, an investigation was conducted of damaged cultural properties mainly in Miyagi prefecture. 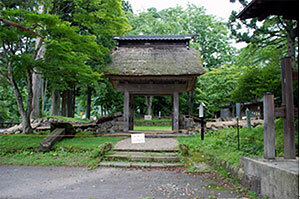 Among those properties that suffered severest damage is the stone fence of Nuruyu-Bansho in Hanayama village, which was built by the Sendai Clan and is designated as a historic site. Since the damage occurred at the same place which had been restored after heavy rain several years ago, it is hoped that the condition and cause of damage as well as past restorations would be investigated more in detail for future restoration work. The Japan Center for International Cooperation in Conservation implements training programs for Iraqi and Afghan specialists who are engaged in the conservation of cultural properties as well as archaeological studies in order to train specialists and transfer technology. 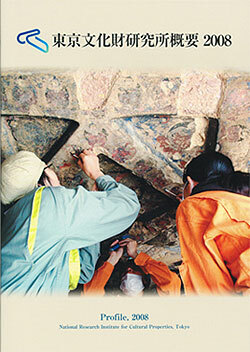 These programs are funded by grants from the Institute and the UNESCO/Japanese Funds－in－Trust. This year, a six－month training is conducted from July 1 to December 10 and two conservators from the Iraq National Museum (Mr. Buthainah M. Abdulhussein and Mr. Thmar R. Abduallah) have been invited. The training program is designed to help these specialists acquire techniques for the conservation and restoration of wooden artifacts and obtain various conservation and restoration techniques. The program enjoys the cooperation of the Nara National Research Institute for Cultural Properties, Shizuoka Prefectural Institute for Buried Cultural Properties, Kyushu National Museum and other institutions in Japan. Two Afghan archaeologists (Mr. Ketab Khan Faizi and Mr. Rohullah Ahmadzai) have also been invited to a training program at our Institute and the Nara National Research Institute for Cultural Properties from July 18 to December 22 in order to acquire basic archaeological knowledge and latest techniques. In October, two conservators from the Kabul National Museum will join the training course for the conservation of Buddhist manuscripts found from the Bamian caves; they will work with Japanese conservators. Training for the group on the protection of old buildings, a part of the program for capacity development along the Silk Road (the first year of a two－year program) that started in Beijing on April 3 ended successfully after 15 weeks on July 11. Twelve trainees from the provinces of Xinjiang, Gansu, Qinghai, Ningxia, Shaanxi and Henan participated in this part of the program. In the latter half of the program (from the eighth week), Qingshoutang Disanyuan of the Forbidden City was chosen as the site for practice sessions on the investigation of building conditions, techniques and measurement. This building is said to have been constructed near Yihejian, the building where Emperor Qianlong lived after his abdication, and to have served as quarters for actors and actresses who played for the retired emperor. Since then, the building has undergone some partial reconstructions, and now serves as workshop for the repair of fittings in the Forbidden City. Five specialists from The Japanese Association for Conservation of Architectural Monuments participated as lecturers at the on－site practical session. The first－year program ended with the completion of the drafting of a restoration plan based on investigation results. A proposal has been made to have the participants engage in the restoration of buildings damaged by the Sichuan Earthquake on May 12 for next year’s on－site restoration practice session.